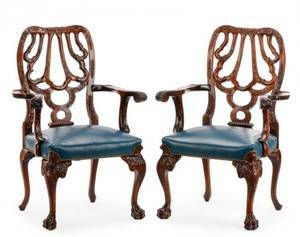 Attributed to William Haines (American, 1900-1973). 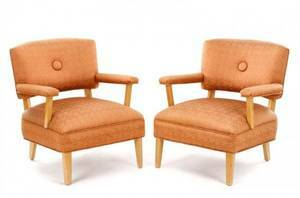 A pair of mid century modern open arm club chairs comprising 4 lacquered birch wood splayed tapering legs surmounted by square seat with rounded back, padded and upholstered arms supported on canted birch supports, and curved and padded upholstered back supported on birch block mounts, allover with geometric patterned sateen mauve upholstery. Unmarked. 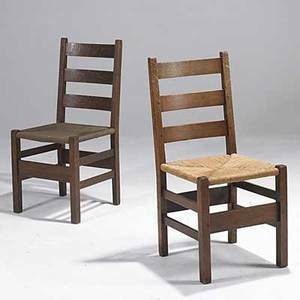 Approximate height 31", width 27.5", depth 32", seat height 16", seat depth 22". 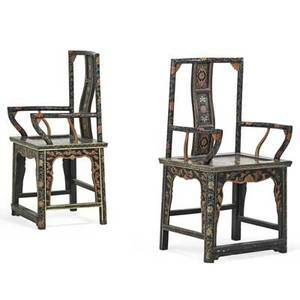 Pair of chinese open armchairs; lacquered jumo with yoke back and stretcher base, 19th c.; 39" x 24" x 17"
Pair of regency open armchairs; paint decorated frames, upholstered seats, caned backs, 19th c.; 33" x 20" x 21"
William "billy" haines (attr. 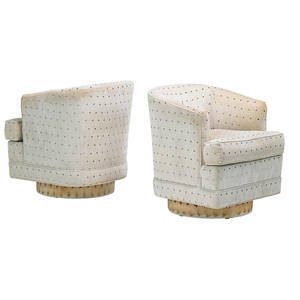 ); pair of swivel lounge chairs, usa, 1970s; studded upholstery; unmarked; 31" x 27" x 29"
Billy haines (attr. 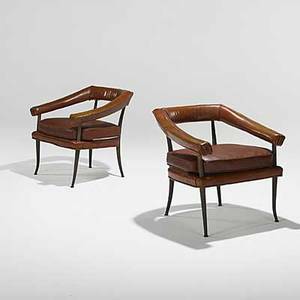 ); pair of brass and leather lounge chairs; unmarked; 26" x 27" x 26"
Billy haines (attr. 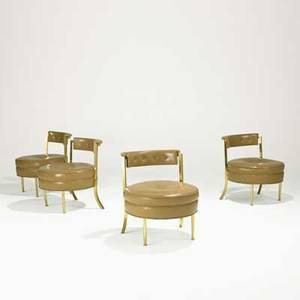 ); four chairs, usa, 1960s; brass, leather; john stuart retail labels; 25" x 21" x 22 1/2"
Milo baughman (attr. 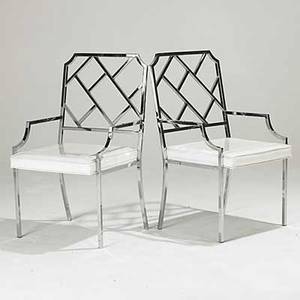 ); pair of chromed steel armchairs; unmarked; 38" x 21 1/2" x 23"
Stickley bros. 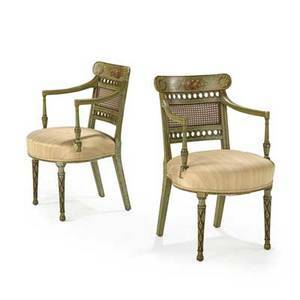 (attr. 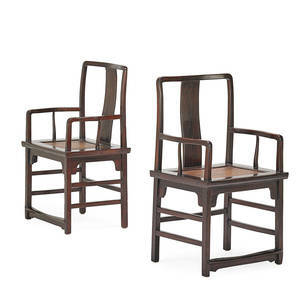 ); married pair of ladder back armchairs, each with rush seat; 36" x 17" x 17"
Milo baughman (attr.) 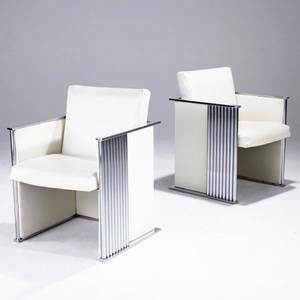 pair of chromed steel armchairs upholstered in white vinyl. 31" x 23 1/4" x 21 1/2"